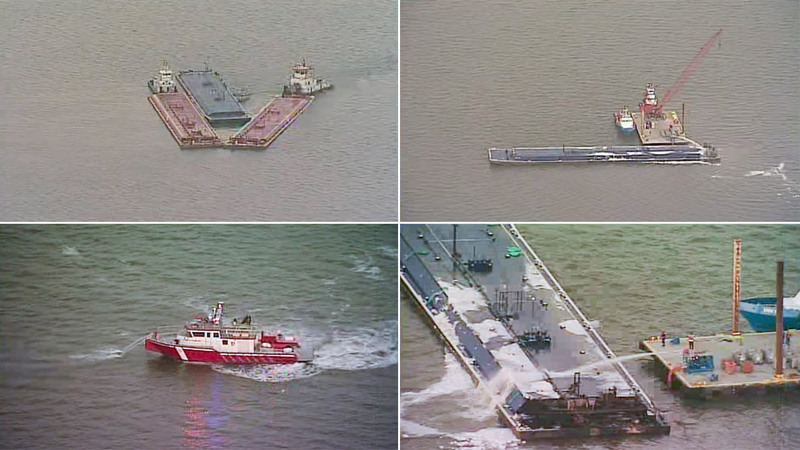 GALVESTON, TX (KTRK) -- The US Coast Guard says the Houston Ship Channel has fully reopened following the collision of two barges early Monday morning. The collision happened around 1:20am Monday. The Coast Guard says both barges were being hauled by tug boats when one of the tugs lost power. The barge it was carrying then struck the other barge. One of the barges, which is hauling petroleum naphtha, caught fire following the collision. An HFD fire boat put out those flames. The collision caused a rupture on one of the barges which was carrying one million gallons of petroleum naphtha. That barge caught on fire. An HFD fire boat worked to put out the flames. By Monday night, it was moved out of the waterway. The US Coast Guard says it's too early to know how much of the product spilled, if any, and what impact it may have on wildlife. The Ship Channel on the Bolivar side to mile 348 is currently closed. Petroleum naphtha is a colorless liquid with a gasoline or kerosene-like odor. It can cause irritation to your eyes, nose and throat, plus dizziness, drowsiness, headache and nausea. There are no injuries reported at this time. The last major barge collision in the ship channel was in March of 2014. 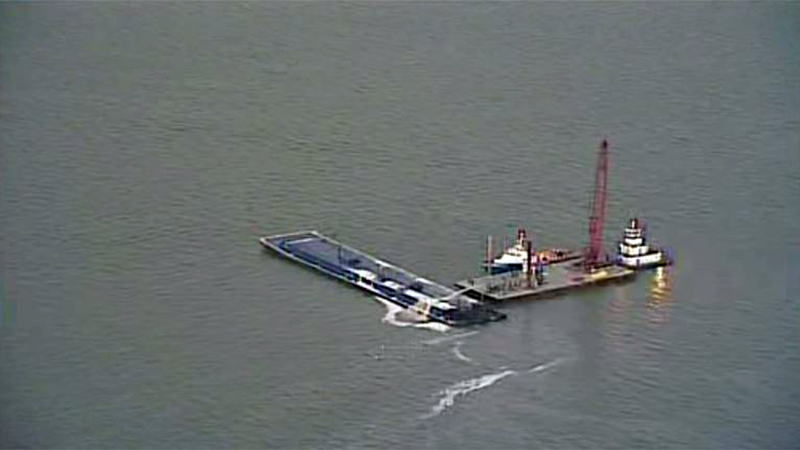 The barge was being towed from Texas City to Bolivar when the 585-foot ship Summer Wind collided with the barge. The crash caused nearly 168,000 gallons of thick, tarry fuel oil to spill into the water. The US Coast Guard says two barges have collided in the Houston Ship Channel. One of those barges caught on fire. - October 29, 2011: Two tankers collide in the Houston Ship Channel. No one was hurt, but it caused millions of dollars in damages. The NTSB investigates. - November 1, 2012: The NTSB releases their conclusion. In part, they chastise the Coast Guard for not "ensuring adequate separation between vessels... in the Houston Ship Channel." - March 22, 2014: Two barges hit in the channel, releasing 168,000 gallons of fuel and putting two in the hospital. - June 10, 2015: The NTSB again raises the question of a vehicle separation policy for the ship channel, "reiterating a need" to the Coast Guard for such a plan.